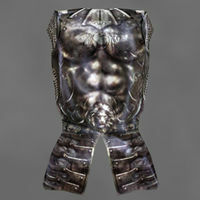 The Lord's Mail, sometimes called the Armor of Morihaus or the gift of Kynareth, is an ancient cuirass of unsurpassable quality. It grants the wearer power to absorb health, resist the effects of spells, and cure oneself of poison when used. It is said that whenever Kynareth deigns the wearer unworthy, the Lord's Mail will be taken away and hidden for the next chosen one. The Lord's Mail is a legendary armor artifact which is precious to the Imperial Legion. The deserter Furius Acilius is suspected in its disappearance, and is thought to hide in the Underground Caves below Ebonheart. See the Lord's Mail quest for more information. Contrary to the in-game description, this armor does not have an Absorb Health enchantment on it. The description more accurately refers to the Arena and Daggerfall versions of the armor. The Lord's Mail qualifies as an Imperial Legion Uniform. Though the item is required for a high-ranking Imperial Legion quest, any player character, regardless of rank or faction, can obtain and use this armor. Simply swim to the cave where Furius is hiding, or get the secret-door key from Furius's garrison bedroom, and go fight him for it. If you are not a member of the Imperial Legion and of sufficient rank within it, you will not be able to trigger the quest to retrieve the armor. However, anyone can get NPCs in Ebonheart to talk about it and provide clues, if you raise their Disposition high enough, even if you have no connection to the Legion. A non-Legionnaire will not be forced to turn it over, or otherwise penalized, and it is among the best Heavy-class armor items available in the game. As part of the Tribunal expansion, this artifact can be sold to Torasa Aram in the museum for 30,000 gold. However, it is required as part of a quest to rank up in the Imperial Legion, though it can be reacquired after achieving the highest rank in the Legion, then sold. If a Legionnaire sold it before then, it would have to be stolen back from the museum at least temporarily.